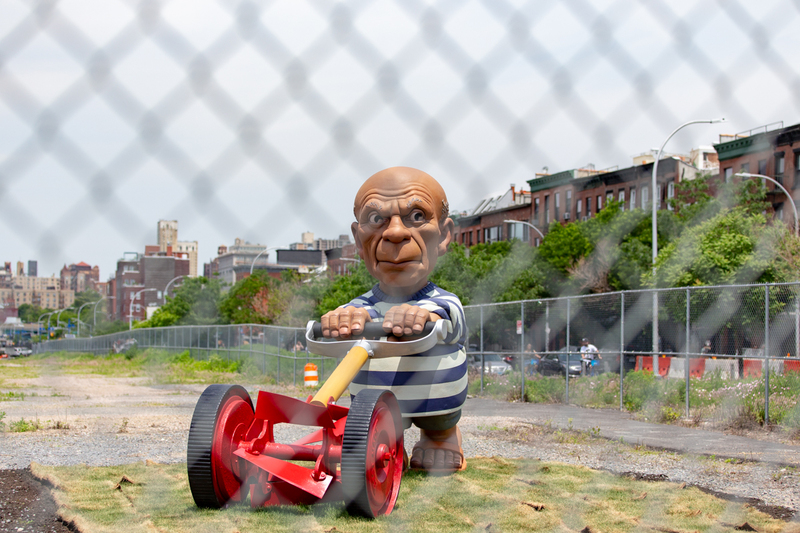 COLUMBIA STREET WATERFRONT DISTRICT – A giant garden gnome depicting painter Pablo Picasso wearing flip-flops and mowing a lawn is catching the eyes of passersby on Columbia Street. A part of Arkin’s satirical sculpture series entitled A Peaceable Kingdom depicting famous artists as garden gnomes performing everyday activities (i.e., Andy Warhol filling a wading pool with a hose, Georgia O’Keeffe picking calla lilies) the massive Picasso caricature is Arkin’s largest work to date. “I used to say that if Picasso was around today he would have to mow lawns for a living. The art world has changed that much,” the artist told artnet. After stints working as a window designer for Tiffany & Co. as well as in film production creating animation for television and commercials, Arkin worked as cartoonist-in-residence for art net Magazine in the 1990s. Arkin’s Picasso is a “visual poem” that’s accessible to all, according to BGI’s press release announcing the artwork’s debut. 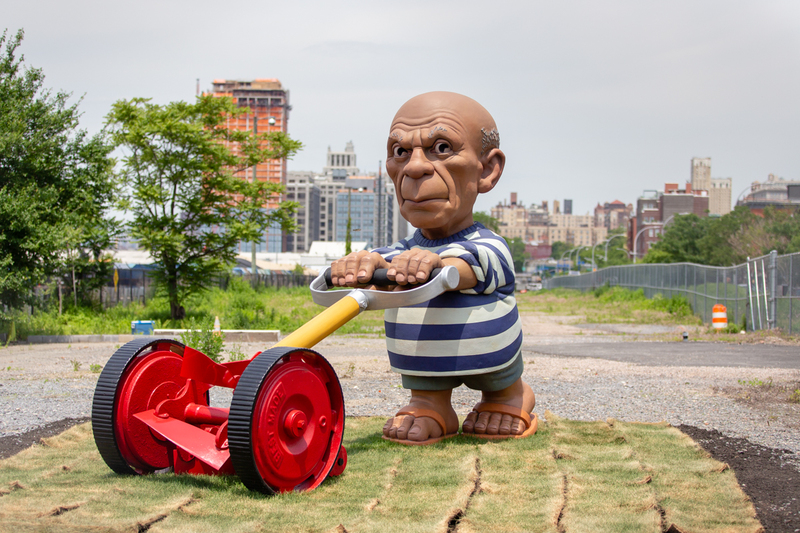 “I like to camouflage my work with these kind of utilitarian objects—a garden gnome, in this instance. It’s presented as something that’s not capital ‘A’ art,” Arkin explained to artnet. 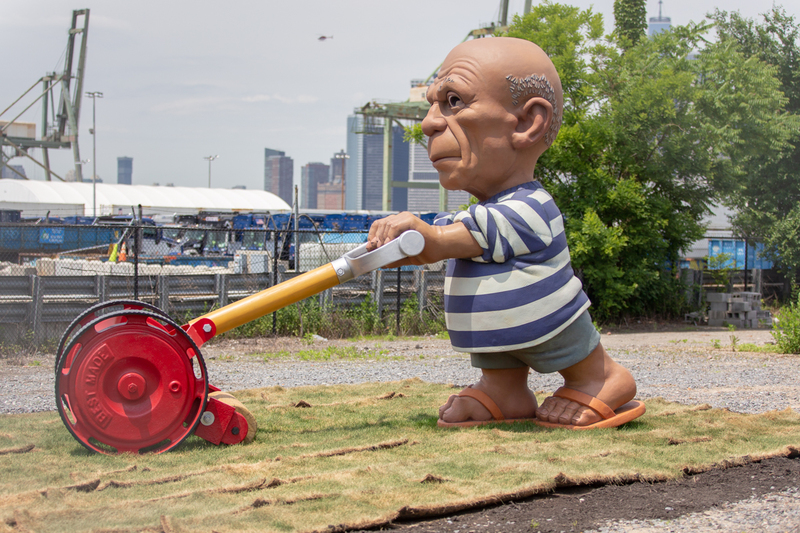 The Spanish Gardener can be viewed as a representation of the common man or the lawn mowing gnome can serve as an analogy of the artist as a gardener, planting ideas and transforming our surroundings. 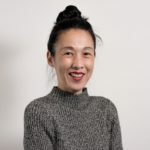 The piece also “playfully juxtaposes the artist/patron/viewer relationship” and satirizes “the art world with political, environmental, and social commentary,” according to the release. Founded in 2004, the Brooklyn Greenway Initiative is a non-profit organization committed to the development and stewardship of the 14-mile Brooklyn Waterfront Greenway. When completed, the off-street, landscaped, pedestrian/cycling/running path will connect 200 acres of regional parks and several neighborhood open spaces from Greenpoint to Bay Ridge. 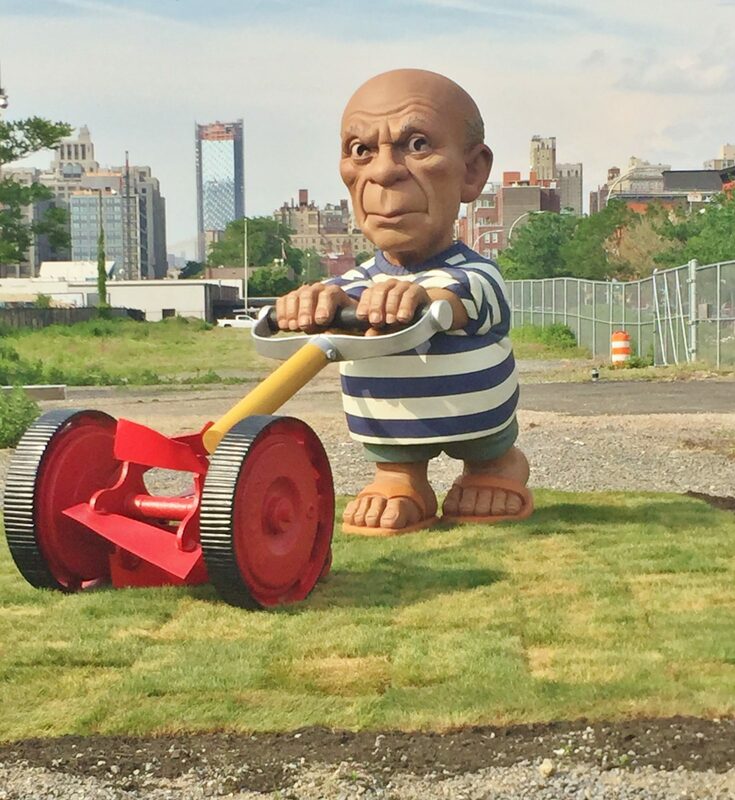 Elliott Arkin’s The Spanish Gardener is on view at the corner of Columbia & Degraw Streets until Sunday, July 15. Learn more about Arkin at his website or follow him on Instagram.